Flavored coffees aren’t usually the first coffee that I look for when I’m looking to stock up on beans. Often, flavored coffees are made with bean blends that don’t pay a lot of attention to the flavor profile of the beans themselves (or not much attention to it, certainly) and count on the added flavor to dominate the brew. This isn’t to say that all flavored coffees are bad, just that you can get away with more than you can when you’re tasting the beans themselves. 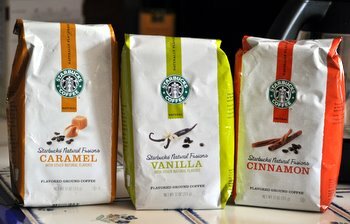 Starbucks Natural Fusions are flavored coffees from Starbucks made with all natural flavors. The Fusions come pre-ground and are sold in grocery stores, rather than at Starbucks locations, and they are available in Cinnamon, Vanilla and Caramel. I wasn’t sure what to expect when I tried them, but I was very pleasantly surprised at how well the flavors came through – with no artificial overtones – in the brewed coffee. The Vanilla is made with ground vanilla beans that lend a subtle vanilla flavor and lend a smoothness to the coffee that makes it go quite well with milk. The Caramel is flavored with butter, licorice orange peel, ground cinnamon and nutmeg and, while it has a bit of spice to it, it also captures a light and buttery toasted-sugar flavor that a lot of flavored coffees miss (or just over-do to the point where they get a funky aftertaste). My favorite was the Cinnamon, and my preference is probably influenced by the fact that I will sometimes add a sprinkle of ground cinnamon to my coffee when I want to spice it up a bit (often at coffee shops when they have just so-so coffee). The Cinnamon is flavored with cinnamon, dried orange peel, nutmeg and sarsaparilla root. It has a definite, but not aggressive, cinnamon flavor and makes a great base for cappuccinos. Overall, I know that in all honesty I will always choose something like Tribute Blend over a flavored coffee, but these coffees are quite good and I really did enjoy them. They are definitely the way to go if you are looking for a flavored coffee because of the all-natural flavoring and the smooth overall flavors. I would also definitely put them on the shopping list when I’m entertaining and need to brew up several big batches of coffee because I have a feeling that they’ll be real crowd pleasers!